Happy 10/10/10 everybody! The calendar abbreviation 10/10/10 will only happen once during this century. This day has no other particular significance that I’m aware of, but with “Happy 10/10/10” wishes flying around the internet, I can’t help being reminded of the Ten Commandments – or more specifically, my Ten Commandments of Jewish Cooking. The Biblical Ten Commandments are no laughing matter. They represent a covenant between God and the nation of Israel; their arrival is one of the most important points in Jewish history. In the Torah, after the Exodus from Egypt, Moses spends 40 days and nights on top of Mt. Sinai. During that time, he receives a revelation from God; he later descends the mountain and presents two stone tablets to the ancient Israelites. The tablets are engraved with the Ten Commandments. These relatively simple laws have had a major influence on human virtue throughout the centuries. 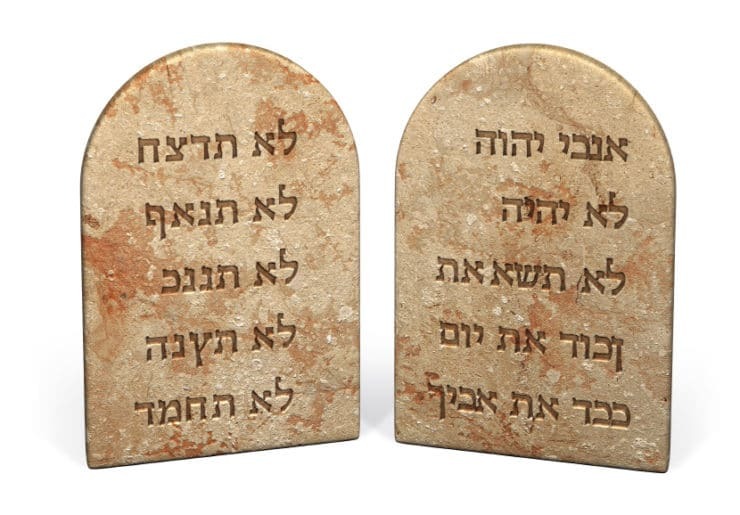 Whether or not you’re a religious person, the Ten Commandments affect your life; they formed the basis of law and morality for Western Civilization. I. Thou shalt strive to be a true balabusta, and have pride in every Jewish dish thou creates. II. Thou shalt not fear the schmaltz. Chicken fat is your friend! III. Thou shalt prepare thine gefilte fish from scratch, not from a jar of jelled broth. IV. Thou shalt not spread mayonnaise on thy pastrami sandwich… it’s spicy mustard or nothing! V. Thou shalt cook thy brisket slowly with moist heat, otherwise it will turn out tough and chewy. VI. Thou shalt not use bouillon cubes to make thy soup stock. Make it from scratch, unless thou is seriously in a hurry. VII. Thou shalt top thy bagels with lox and a schmear. A few capers won’t hurt, either. VIII. Thou shalt make matzo balls the way thy bubbe made them. Bubbe always knows best. IX. Thou shalt always make more food than thou needest. Leftovers are mandatory. X. Thou shalt keep it kosher! Now that you know my Ten Commandments of Jewish Cooking, I want you to make a list for me! Please comment me and let me know your Top Ten Favorite Jewish Dishes. Happy 10/10/10! Correction: 10/10/10 occurs once this CENTURY, not once this millennium…. I grew up loving matzo ball soup, my mom and I used to stop at a litle jewish deli, just for the matzo ball soup. So glad you all enjoyed this list. Your favorite Jewish food lists have made me super hungry! I love the 10 commandments of Jewish cooking…I love potato pancakes, lox and bagels. Keep up the good work. Just found your website and really enjoy it. Very nice! One note, the any date abbreviation will occur exactly one time during a millennium! I love your ten commandments of Jewish cooking, they make perfect sense, you clearly have a deep understanding of what culturally makes a Jew, because it’s not just religion alone, and by george I think you’ve got it! All the aforementioned foods from others have my mouth watering, and I can’t think of anything to add at the moment. Matzo Ball Soup, Sweet Noodle Kugel, Brisket, Cabbage Soup, Challah, Apple Cake, Mandel Brot, Tzimmes, Blintzes, Cheese Cake, Bagels, Corned Beef, Stuffed Cabbage, Israeli Salad,potato latkes and so much more, but I’ve already gone beyond 10.
pickles:sweet & sour or regular,lox.nice lean,corned beef,tongue ,or pastrami sandwich ! Hilarious! Your challah bread recipe is at the top of my list, it’s the best I ever tried. Happy 10-10-10 back atcha! My all time favorite has to be chopped liver. I used to make it from scratch. My friends called it “a heart attack waiting to happen” because of the chicken fat. My mom used to make the best sweet and sour soup. My father’s sister-in-law (who by the way is not Jewish) makes the best kugel. I loves your 10 Commandments. Can I add some sephardi dishes to the list?? Stuffed zucchini, lentil soup, falafel, stuffed grape leaves, lamb stew, baklava, and anything Yemenite. Would love to get your recipe for falafel! You are too cute! I don’t know about my top ten, but here are my favorites: corned beef, strudel, cholent, kishke, potato knish. LOL too funny! Love this. here’s my top ten: kugel, bagels and lox, matza ball soup, tzimmes, flanken, kasha varnishkas, honey cake barley soup, pickles, and my very favorite stuffed cabbage. Now I’m hungry!